Small companies dash around seeking big agency expertise at small agency prices and usual get neither. In this first of its kind on SLMA Radio we do an agency review and we start with that most rare of agencies, one that wants to service small businesses. 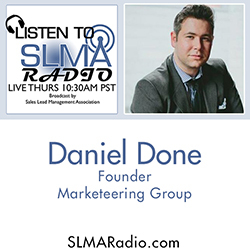 In this program we review the Marketeering Group and CEO, Danny Done. The host is Jim Obermayer. A digital marketing agency that serves small businesses efficiently is vitally needed and Danny Done with the Marketeering Group has figured it out to his and their benefit.